Fantastic new eateries, show-stopping art, home of Lady Gaga’s new residency, and a secret hotel within a hotel has made Park MGM the new must-see property on the Strip. Back in 2016, MGM Resorts International announced that the Monte Carlo, open since 1996, would be rebranded. The resort sat on a great location, but it was known for little else than its shopping experiences. The rebrand to Park MGM sought to make the resort a destination in its own right. And it achieved that through its superb attention to detail, from entertainment to food to design. The name plays homage to The Park, the urban oasis between Park MGM and New York-New York Hotel & Casino next door. The outdoor dining and shopping area is one of the few gambling-free zones in Las Vegas. On top of a fresh name, the hotel has a new look, new themes, and new restaurants. 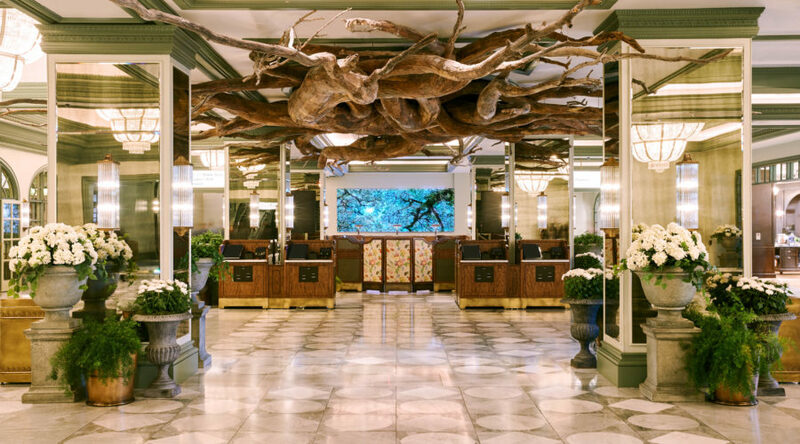 Park MGM has doubled down on art throughout the property. Arriving into the lobby, the massive wooden piece sprawling across the ceiling will immediately catch your eye, but even more impressive is the work on the back wall. The moving art piece presents the image of a tree depicted in two mediums: one painted and another in a video of the same tree moving with the wind, overlaid on the painting on a massive screen. To explore the entire property’s art collection, the resort hosts a weekly Wednesday art walk, making Park MGM almost double as a museum. But the art that most folks will be excited about is music. The onsite theater has been rebranded as Park Theater, and is the new residency for Lady Gaga as of December 2018. Another huge draw at the renovated Park MGM? The new eateries and bars. Additions of the famed Eataly, Roy Choi’s Best Friend, and the largest gin collection on the strip at Juniper make it a foodie destination. Best Friend is a major eye catcher for the funky bodega bar at the entryway, before passing into the main restaurant through a bright red wall of fake noodles. There’s a decidedly 90’s theme, from staff in coordinated sweatsuits and decade-appropriate menu art. The Korean BBQ selections, inspired by Choi’s L.A. food truck fame, are surprisingly affordable for the star power attached to the location, making Best Friend a great spot for families or large groups to enjoy amazing food without spending a fortune. Best Friend sits next to Eataly, a vibrant Italian marketplace. Its Park MGM location marks its second spot on the West Coast, with stalls for getting pizza by the slice, a glass of wine, and much more. Park MGM also boasts a new lineup of bars and a club within the property, including the sports bar Moneyline that has a by-the-pound nachos counter in the back called Side Betty (perfect for when hunger strikes). One of the coolest features of Park MGM is its hotel-within-a-hotel, NoMad, which comprises the top four floors of the Park MGM. NoMad has its own pool, restaurant, and bar, and it has a moody palette compared to MGM’s neutral leanings. Its luxurious library vibe is accented with velvet, dark wood, and its own series of art. Each of the rooms on NoMad’s floors has different original artwork inside of it. Next time you plan a visit to the Strip, hit up the Park MGM (or NoMad nested inside) for a multidimensional Las Vegas experience.